A T-bone accident is one where the front of one car or truck crashes into the side of another vehicle. Broadside accidents most often occur at intersections when one of the drivers fails to stop at a stop sign or traffic light, or otherwise fails to yield the right-of-way to the other driver. T-bone collisions are more likely to lead to severe injuries to the drivers and passengers involved in the crash. Drivers and passengers may suffer from brain injuries, broken arms and legs, and spinal fractures. One reason broadside impacts result in so many serious injuries is the vehicles are often knocked off course and into a second collision. The broadsided vehicle is suddenly pushed sideways, either toward the roadside or toward the direction of oncoming traffic. Likewise, the force of a T-bone collision will often spin the striking vehicle in the direction that the other vehicle was moving. Once a vehicle is off its intended course, the occupants face the risk of further collisions and traumas, crashing into guardrails, telephone poles, and other vehicles. If the force of the collision is strong enough, the broadsided vehicle may roll over completely, especially if it is knocked onto a sloping road shoulder. Another factor that increases the number of severe injuries in T-bone collisions is the close proximity between the impact point and the driver or passenger in the broadsided vehicle. Obviously, there is much more distance between you and the front and rear bumper of your car than there is between you and your car door. That translates into much less protection from a broadside impact than you have from a head-on or rear end accident. Although many modern vehicles have side-impact air bags and crumple zones designed to absorb impact from the side, a fast moving truck or car that hits a point just a foot or so away from the driver or passenger is going to do harm - a lot of harm. With the broadsiding vehicle putting its full force straight into the relatively unprotected side of the other vehicle, T-bone accidents are even more likely to cause serious injuries than sideswipe accidents. The rules of the road applicable to broadside collisions start with every driver’s responsibility to stop for stop signs, Tennessee Code Annotated sec. 55-8-149, and to obey traffic control devices including traffic lights, Tennessee Code Annotated sec. 55-8-109. If a vehicle has already entered an intersection, it has the right of way, and other traffic must yield to be safe. Tennessee Code Annotated sec. 55-8-128(a). If two vehicles enter an intersection at the same time, the driver on the left must yield to the vehicle on the right. Tennessee Code Annotated sec. 55-8-128(b). Just because a driver has a green light does not mean the driver can drive through an intersection without due care. Every operator of a motor vehicle has a responsibility to do what he or she can to avoid an accident. A driver who carelessly drives into an intersection without looking for any dangers up ahead may be liable for causing an accident, even if he or she technically had a green light. 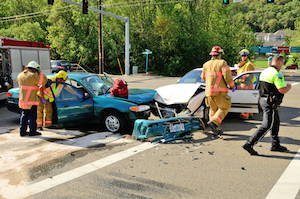 Some T-bone accidents are caused by a truck or car making a left turn in front of another vehicle. A driver making a left turn at an intersection has to yield to all oncoming traffic that is close enough to be a hazard. Tennessee Code Annotated sec. 55-8-129. It is illegal to turn before the maneuver can be made with reasonable safety. Tennessee Code Annotated sec. 55-8-142. A driver who causes a crash by taking a left turn in front of oncoming traffic when it is unsafe to do so may be held accountable for the harm to other people in the crash, including passengers in the driver’s vehicle. Once the way is clear, the driver making the left turn has the right of way, and any oncoming vehicles must yield. Tennessee Code Annotated sec. 55-8-129. If a driver has enough time to stop and let a vehicle ahead complete its left turn, but instead continues driving into the intersection and crashes into the left turning vehicle, that driver may be responsible for any injuries resulting from the accident. To prove which driver had the right of way and who could have avoided a crash by acting reasonably, a thorough investigation is often necessary. There may be evidence at the scene that shows the path of each vehicle, such as skid marks, yaw marks, gouge marks, tire marks in gravel or mud, and impact marks on guardrails or other impacted surfaces. Cameras on traffic lights or nearby businesses’ surveillance footage may be available to show what happened. Our skilled and experienced team has significant experience helping victims of broadside collisions, so contact us online or call us anytime at 615-742-4880 or toll-free at 866.812.8787 if you would like to discuss a potential T-bone collision case.